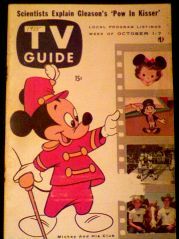 This is a Virginia edition TV Guide from October of 1955 that features the premier of many monumental television programs, including the Mickey Mouse Club, Captain Kangaroo, The Honeymooners, and Alfred Hitchcock Presents. A true piece of television history! Cover has a quarter-sized white spot from where the address label was removed and the pages have yellowed with age, but overall this copy is in great condition with no tears or loose pages. The year "1955" has been written in ink on the cover inside the "T" of the TV Guide logo. Wow, this was a big week in the history of television! Sales of Mouseketeer hats skyrocketed after this show's debut. Every boy fell in love with Annette (I don't know who the girls liked, maybe Lonnie). Website design and hosting by Sohodojo Business Services. Item 247 of 466 items displayed in viewer. 0 items in cart.